With the new Pet Zoom Pet Park you can now prevent pet accidents in your home. Your dog can now go when it needs to. The Pet Zoom Park is an indoor doggy potty that is made with a synthetic grass like surface that prevents stains and rinses clean in just seconds. Unlike dripping newspapers and expensive wee wee pads, Pet Zoom Pet Park’s reusable surface stays fresh and sanitary. It has a triple stage protection that allows fluid to pass through the antimicrobial mat. The liquid drains into the collection tray on the bottom while the top mat stays dry. The Pet Park can hold up to an entire gallon of water and clean up is a breeze. You just empty the collection tray and rinse it at the end of the day. 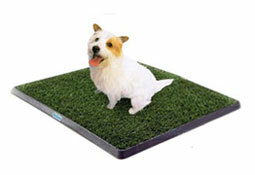 The Pet Zoom Pet Park comes with an AntiMicrobial Mat, the Pet Park Base, and a Collection Tray. Right now you can order it for just $29.95 plus shipping and handling. In addition, you’ll also receive a free Pet Zoom Nail Groomer with your order. Use it to trim your dog’s nails with ease. Just pay the additional shipping. 4 Comments on "Pet Zoom Pet Park"
WHERE DO I GO TO SEE THIS.